Add some glowing lights to your next outdoor gathering with these beautiful lanterns! Just a few simple supplies are need to create them and a few Command™ Outdoor Medium Slate Hooks to hang them up with! 1. Prep the jars as instructed by the glass paint manufacturer. 2. Use ScotchBlue™ Painter's Tape to cover the bottom of the jar to keep the paint off of it. 3. Paint the outside of the jars by letting the paint slowly run down the jars, making sure to cover the glass fully. 4. Stand the jar up on a paper or plastic cup to keep the paint from sticking to the table. Let paint dry according to manufacturer's instructions. 5. Wrap wire around the jar, close to the bottom of the lip. Screw on the outer ring of the lid, without the inner circle. 6. Light LED candles and put them in the jars. Hang on Command™ Outdoor Medium Slate Terrace Hooks. 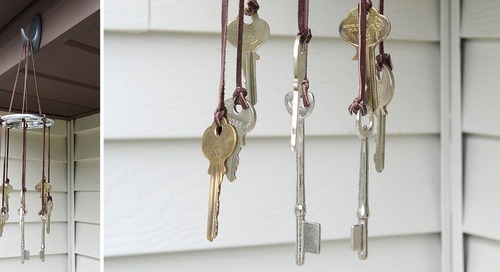 Vintage keys and a vintage gear make a charming wind chime for your home. A fun up cycling project using a few simple items and hung up damage-free with a Command™ Outdoor Medium Slate Terrace Hook. Projects Products How to Use Promotions Do. No Harm. 3M, Command and Home Made Proud are trademarks of 3M. Used under license in Canada.